The wedge-shaped plot of the care cluster derives from its context at the intersection of two main roads. It combines a health centre and chemist's on the ground floor with 52 rented and freehold apartments above. A century-old oak that was to be retained stands on an inner court in the company of two small low-rise blocks. The apartments are accessed from an ellipse-shaped atrium that tapers upwards to terminate in a light court. 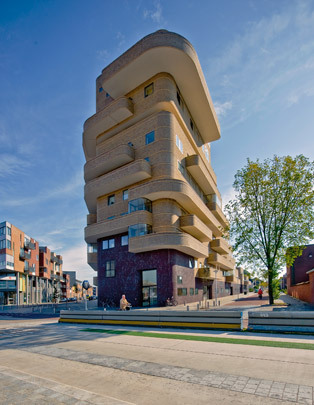 The building resembles a brick sculpture with rounded corners and continuous balustrades. If the brickwork was inspired by the Amsterdam School, the formal syntax seems allied to the work of the Parisian architect Henri Sauvage.